(NaturalNews) Okra, also called gumbo or lady's finger, is a tall, flowering plant that is cultivated in tropical, subtropical and temperate regions around the world. It has been prized for centuries for its edible green pods, which transform into a thick, gooey mucilage once cooked. 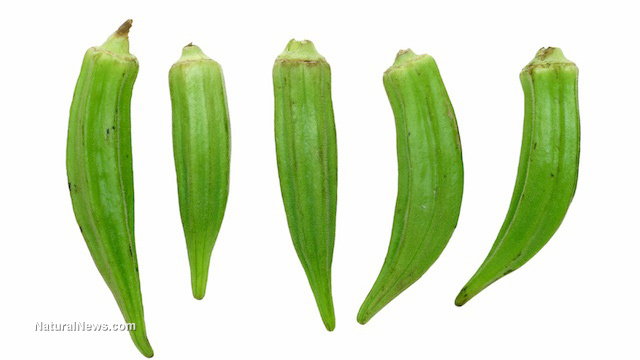 However, many cultures like to cook okra pods with acidic ingredients, such as lemon juice, which reduces their mucilage and makes them suitable for drier vegetable dishes. Although not as well-known as other supergreens, such as broccoli and kale, okra shares a similar nutritional profile and its significant health benefits are gradually being confirmed by peer-reviewed studies. Antidiabetic properties -- A study published in the Journal of Pharmacy and Bioallied Sciences in 2011 found that diabetic rats that were fed okra peels and seed powder over a 28 day period experienced a significant reduction in blood glucose levels compared to the control group. The researchers attributed this result to okra's high fiber content, which "helps to stabilize blood sugar by regulating the rate at which sugar is absorbed from the intestinal tract." Another study published in the Jilin Medical Journal in October 2005 found that regularly consuming cooked okra could help prevent kidney disease. "Those who ate okra daily reduced clinical signs of kidney damage more than those that simply ate a diabetic diet." This information helps to reinforce okra's antidiabetic properties, since an estimated 50% of all kidney diseases are triggered by diabetes. Digestive benefits -- Mucilaginous foods, including okra, have often been praised for their ability to treat digestive issues. A study featured in the Public Library of Science in January 2014, for example, showed that the polysaccharides present in immature okra pods possessed considerable antiadhesive properties (i.e., they help remove the adhesive between bacteria and stomach tissue, preventing the cultures from spreading). Okra's polysaccharides were particularly effective at inhibiting the adhesion of Helicobacter pylori, a bacterium that dwells in the stomach and can cause gastritis and gastric ulcers if left unchecked. Therefore, eating more okra can keep the stomach clean and create an environment that prevents destructive cultures from flourishing. Potent natural laxative -- Okra's digestive benefits aren't just limited to treating stomach problems. According to Self's "NutritionData," one hundred grams of okra contain 10% of the recommended daily intake (RDI) of fiber. More important than the quantity of okra's fiber, however, is its quality. Due to its slippery mucilage, this fiber is not as harsh on the intestinal tract as that of wheat and other hard-textured foods. It smoothly sails down the colon, absorbing all toxins and excess water in its path. Okra's efficacy in this regard has prompted many researchers to liken it to an oil that lubricates the engine of the body. Promotes healthy skin and blood -- One hundred grams of okra also contain approximately 27% of the RDI of vitamin C and 50% of the RDI of Vitamin K. Vitamin C is, of course, an essential antioxidant that aids in the growth and repair of bodily tissues. For this reason, eating more okra can rejuvenate one's skin and hair, and also shield one from degenerative diseases associated with long-term free radical damage. Vitamin K, on the other hand, plays an important role in blood clot formation and can help treat blood-related conditions, such as nosebleeds, bleeding gums and heavy menstrual bleeding.